Looking for tempo activities to add to your elementary music lesson plans? 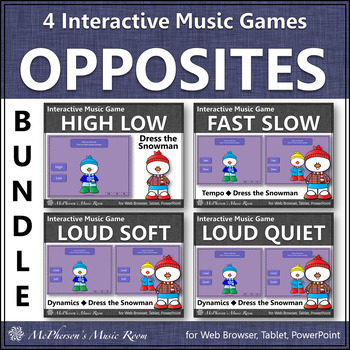 Aurally identifying the music opposite fast or slow has just become fun and exciting with this digital resource via tablets or on your internet browser! It is perfect to use in the winter or anytime you are working on tempo. 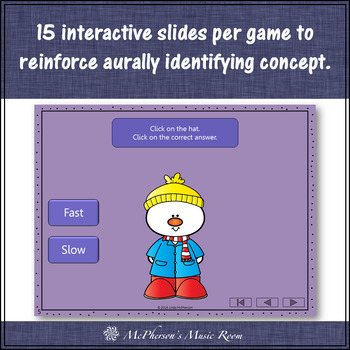 Looking for winter music activities that reinforce aurally identifying music opposites and music comparatives: high/low, fast/slow and loud/soft (loud/quiet)? Want them to work on tablets and web browsers? 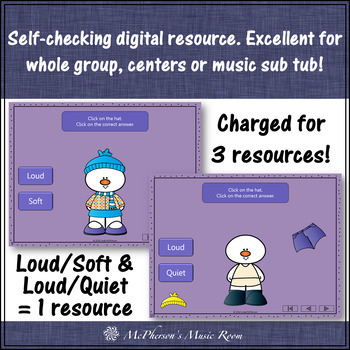 These digital resources are a perfect addition to your music lesson plans or anytime you are working on tempo, dynamics and melodic direction. 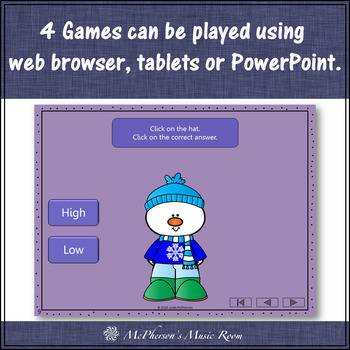 Engaging interactive music games for the entire class, music sub tub or music centers! The Bundle contains 4 products that are sold separately in my store. Click on a product name for additional details. Consider purchasing the bundle to save money! Please note that the price reflects 3 products. I did not charge for both products that reinforced the concept "loud/soft" or "loud/quiet". Each product contains 15 student interactive slides. Each slide has several sound effects and animations. Students will click on the hat to hear a sound. They will then click on the answer that represents what they hear! Students will know immediately without leaving the page if they are correct. They will love seeing the snowman build right before their eyes when they select the correct answer in this Dress the Snowman game! Perfect addition to your Orff lessons and Kodaly lessons. The games are designed to be projected onto your SmartBoard, Promethian, Mimio or Interactive Whiteboard and will run on both PC and Mac computers using your default internet browser. They are also compatible for iPads/tablets! In addition, the PowerPoint version of the games have been included in the purchase as another option for utilizing the product. Until TpT supports this file type I have stored the data files on a separate server which allows the graphics and sound effects to remain secure. You will be able to access the games via a provided link. Upon purchase please read the document titled "1 READ FIRST INFORMATION" for detailed instructions.